Congratulations on your new home! Whether it’s your first home or your fourth home, there are some essential tools that you will need in your toolbox for basic repairs. Whether it’s a last minute sink leak, or adorning your walls with precious mementos, investing in quality tools will spare you a headache in the long run. Safety Goggles – Safety first! Protect your eyes from any debris, irritating chemicals, etc. Measuring Tape – Before beginning any project, measure your area to ensure that you have enough room and that objects are equally distanced from each other. Premeasuring and marking can prevent mistakes from happening or redoing any project. Hammer – If it’s not put together by screws, it’s put together by nails! Handy for quick fixes or repairs. A basic toolbox must-have. 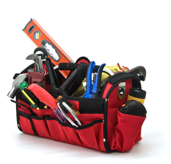 These are just some of the many tools that can be helpful when taking on home repairs. Separate yourself from homeowner to self-made handy man! What are some tools in your toolbox?